Read Part of Lesson One Free! You’ve made it through that first short story draft…but you know it’s going to take a lot more work to turn that draft into a saleable manuscript. 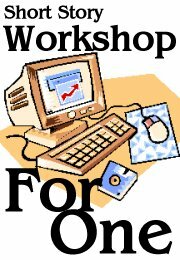 What you really need is a workshop experience, but time, money or other considerations won’t allow for that right now. The Short Story Workshop for One course is the answer! Six lessons will guide you through your story, identifying problem areas and helping you craft a more professional manuscript. The Workshop For One method breaks down the process of editing your story into manageable chunks, allowing you to focus your attention on one element of the story at a time. By guiding you to ask pertinent questions and evaluate the various facets of your story and your writing, redrafting as necessary, the lessons steer you toward a stronger, cleaner, more sophisticated draft. Less than $1.50 per lesson to refine and improve every element of your story. A new downloadable, printable lesson in .pdf format will arrive via email every day for six days, beginning whenever you sign up. The course is structured to allow you to focus on one element of your story at a time, keeping you motivated without becoming overwhelmed. Writing a first draft can be easy. Editing it into a great finished product takes special effort. By using the writing plan outlined in this course, however, you can improve the writing in every story. Your first draft is your raw material. This course can help you turn that raw material into a finely polished piece. Canadian writer Sherry D. Ramsey’s first writing love is speculative fiction, and her short fiction works have appeared in print and online. For the past ten years she has been the Editor/Publisher of The Scriptorium, a monthly web magazine dedicated to offering a wide variety of resources to help writers start and maintain successful writing careers.